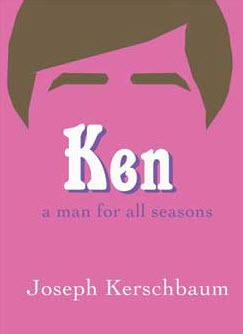 We are super excited to announce the release of my new book, Ken: a man for all seasons! The book is now available via the publisher, Plan B Press. Here is a brief description of the book: On the surface, Ken: a man for all seasons seems to be about a doll. It is about a doll. Written from the perspective of Barbie’s famous boyfriend, the voice of Ken is harsh, cynical, sad, and humorous. Ken is the All-American man, yet no one is certain what that really means any more. Ken may be the narrator of this collection but the topics of these poems are wide-ranging. Ken is just a doll, but his core concerns are universal: individuality, identity, masculinity, loneliness, destiny, purity, passion, and the list goes on. Like anyone, Ken is looking for his place in the world. More precisely, he is questioning his predetermined place in the world. I’m super excited about this book. It’s rather different from what I’ve published in the past. It took about two and half years to complete. Along the way I wasn’t even sure the project was offering anything of value. Basically, it seemed kind of lost. When I hit that point in a project I find one of the best things to do is to walk away. I left it alone for four or five months. Once I started up again, everything became clear. Finishing the book was actually rather easy after that. And I’m extremely proud with how it turned out. The cover art fits the tone of the book perfectly. In the end, everything came together. Check it out! Happy National Poetry Month everyone! I hope you’re writing a poem-a-day and getting out to some awesome readings (and giving some awesome readings!). 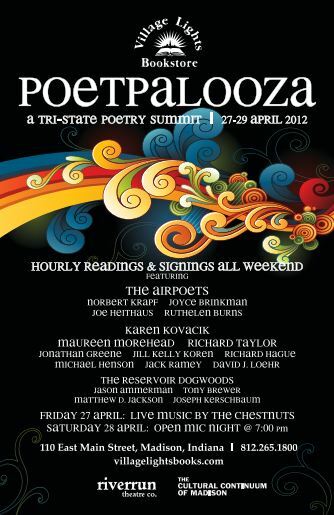 Thinking of readings, there is a very cool event coming up in a few weeks – Poetpalooza! The Reservoir Dogwoods will be heading the closing night! Very exciting! Get all the details at the official Facebook event page. 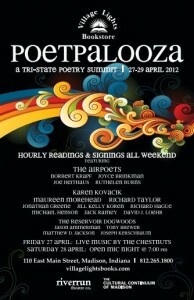 Village Lights will host POETPALOOZA 2012: A Tri-State Poetry Summit, Friday, April 27th, through Sunday, April 29th, with hourly readings and signings by sixteen acclaimed poets from our region (IN, KY, OH), including two published poets from Madison and five Poets Laureate of Kentucky and Indiana, in a flow-through setting. Come for one, or come for all! Live music Friday evening with The Chestnuts. Community open mic session Saturday evening. Sunday the Dogwoods are damming the Ohio! Why? Because we’re the beavers of the poetry kingdom. The Blood an Bone Show – Spoken Word Tour! Let’s hit the road again! I’ll be hitting the road with my good friend and fellow Reservoir Dogwood, Matthew Jackson. We’ve been meaning to tour together for a while and he has a new, nifty book out in November so it all came together like a tasty, tasty cake. We’ll be doing old pieces, new pieces, duet pieces, and all kinds of hijinks. You’ll just have to see it to believe it! Check out the events page for more information! 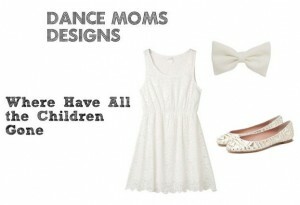 Where Have All The Children Gone? They’re on Lifetime! Also, this may be a first: an ensamble inspired by one of my poems. This may be the first article of clothing that I’ve seen inspired by a poem (not just with the actual poem on a t-shirt). You can buy it here. Thanks to everyone for supporting this piece and for your enthusiasm. The universe is a funny a place. Greetings One and All: I hope everyone has had a fantastic summer. Mine has been extremely grand and busy. Sadly, summer doesn’t have the same magic as when you’re in school. Sure, it’s nice outside but the air isn’t as sweet with possibility. But at least it’s not cold. Anyway, I’ll be taking part in the 4th St. Festival in Bloomington this Labor Day weekend. There is a Spoken Word Stage and that’s where I’ll be. I have a solo set on Saturday and a set with the Reservoir Dogwoods on Sunday. Here is the Facebook event page for all the details. Have a great holiday, and perhaps I’ll see you at the festival. Cheers! For those who don’t know, I have an alternative existence as Client Services Director for the most awesome Clix Marketing. Also, I’m an SEM author for a number of publications including Search Engine Watch, Website Magazine, and the Clix Marketing Blog. 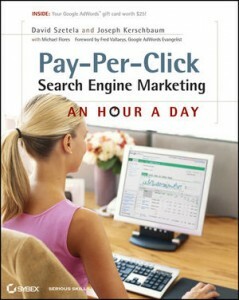 However, the most recent MAJOR undertaking was writing Pay-Per-Click Marketing: An Hour a Day for Wiley/Sybex. When I say tome, I mean 400+ pages. Yeah, it’s huge. I co-wrote the book with PPC God (and my neat-o boss, David Szetela). Wanna learn about my non-poetic endeavors? Check out the Wiley/Sybex website! For the PPC book, I’ll be doing more nation-wide speaking engagements, seminars, and webinars. Let the good times roll! NOW, on to the poetic adventures. There are ALWAYS projects in the works, but if you know me – I don’t like to talk about anything forthcoming until all of the details have been nailed down. Let’s just say there are numerous gears turning and soon the lumbering locomotion will begin to churn and move. 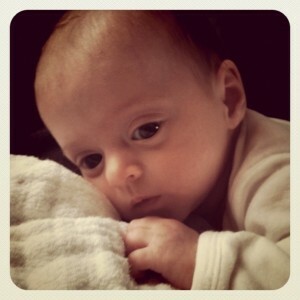 2011 is gonna be a great year! The first few gigs have been posted in the Readings/Gigs section of the site. OK, that’s all for now. Just wanted let you know that I haven’t forgotten about you, Thirsy Ocean. Far from it. Columbus, IN. Performance poet Buddy Wakefield appears at YES Cinema on Sunday, September 12 at 7pm. Indiana’s own spoken word group, Reservoir Dogwoods, will be opening Wakefield’s show. Born in Shreveport, LA, Wakefield now calls Seattle his home. In 2001 he left his position as the executive assistant at a biomedical firm in Gig Harbor, WA, sold or gave away everything he owned and “set out to live for a living,” touring North American poetry venues. Since then, he has shared the stage with nearly every notable performance poet in the world. Buddy Wakefield is one of the nation’s most notable performance poets, known for delivering raw, rounded, high vibration performances of humor and heart. In 2004 and 2005 he won the Individual World Poetry Slam Championships, a competition where poets recite original work and are judged not only on their poetry, but the manner of deliver and passion behind their words. Advance tickets for the performance are $10 for adults and $5 for students. At the door tickets will be $12 for adults and $7 for students. Tickets can be purchased at YES Cinema. 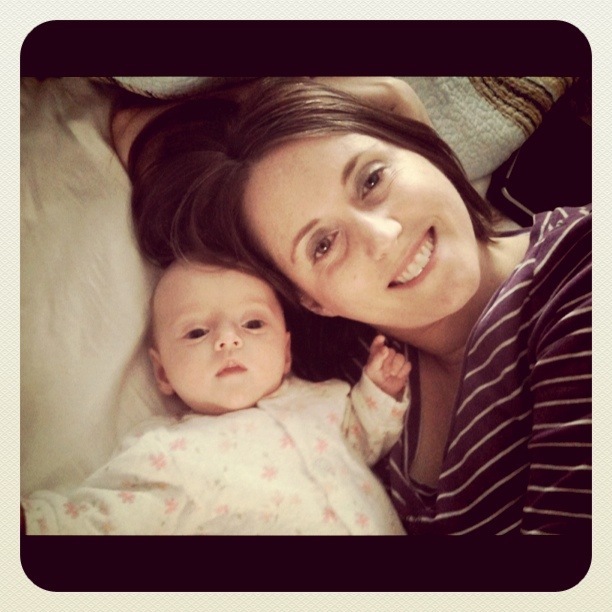 For additional information, please call LCNFC at 812-379-1630 or visit www.lcnfc.org. The Columbus Area Arts Council is a public, not-for-profit corporation supported by private donations, the City of Columbus, the State of Indiana through the Indiana Arts Commission, and the National Endowment for the Arts. Hey everyone. This is just a quick note to let you know that I’ll have some new poems in the next issue of The Battered Suitcase. You shouldn’t pick up a copy just to read my meager contribution, it’s a great publication and you’ll enjoy the whole thing! More to follow. There is always more to follow. Cheers. Here is another quick installment of my current musical obsessions. These albums are outrageously grand. I highly suggest all of them for your listening pleasure. Cheers! There are a couple sources of inspiration for this post. First, the other day I was typing some poems out of the ol’ notebook. Second, recently my Reservoir Dogwoods brothers have taken to calling me a, “poetry superstore,” because I tend to publish books and poems at relatively rapid pace. The relativity in this case is in relation to other poets, I think. All of this got me to thinking about my writing process. I came to the realization that it’s remarkable I write anything at all, and I also realized the odds are definitely against me when it comes to writing anything worth reading. Every writer works differently. There is no doubt that I’m my own harshest critic. I think being objectively critical of your own writing is a blessing and a curse. It means that there is a little editor, or perhaps an entire workshop, living in my skull telling me what works and what doesn’t work. However, this tiny audience is tough to please, therefore they tend to think everything I write is complete rubbish. This makes the writing, editing and publishing process more laborious but I think the writing is better for it in the end. Let’s walk through my writing process (perhaps yours is similar!) and let’s do the math. The first step in my writing process is the notebook. I start out writing all my poems long-hand in a notebook. There is just something about putting pen to paper that makes the writing process real for me. Sure, I’ve written poems on computers but I find that I do too much instantaneous editing and revising. This means that it takes an eternity to write a poem in this fashion because I’m editing and revising every line before I’ve even written the next one. The notebook gives me the freedom to say, “Just get it down. Don’t revise as you go. You can do that once you type of the poem.” That’s what I do; just let it roll. To keep a statistical calculation of the writing process, let’s say that I’ve written 10 poems in my notebook. Right now, 100% of these poems could be keepers. By “keepers” I mean poems that eventually make it to the submission process, when I think the poem is ready for the world . After I’ve accumulated a few weeks worth of writing, I’ll go through the notebook and start typing the poems into a Word document. Who am I kidding? Let’s face it, I usually type up poems every couple of months. During this period, I re-read what I wrote in the notebook and if a poem seems to have some momentum, I will type it out. This is my least favorite part of the writing process; the transcribing from notebook to laptop. Since this is the case, I try to type out as little as possible. Why type up a poem that is DOA? It’s a waste of time and my fingers get friggin’ tired. During this process, I usually weed out about half of the poems I’ve written. I’ve gotten pretty good (or the editor in my brain has) at determining which poems have potential and which were just random ideas, or just complete crap. So, if I start out with 10 poems in my notebook, only 5 actually get typed up. This means that half of the poems I write don’t even make it out of the notebook, or 1 in 2 poems don’t see the light day (or computer screen). Once a poem has been transcribed into a Word document, then I’ll take some time with that poem and do some tweaking, revisions, and general meditating. It’s usually at this step in the process that the shape of the poem will begin to form (pun intended). When I write in the notebook, I usually just stick the left margin of the paper. However, now I start experimenting with the space on the page. While I’m digitally revising a poem I’ll often realize that it shouldn’t have been typed up in the first place. I’ll be frustrated for a moment that my internal editor/workshop didn’t catch this and I wasted time typing it up, but then I move on. On average, about half of the poems I type up end up in the “Poem Limbo” file. This where poems are regulated when they’ve been typed but are going no further. 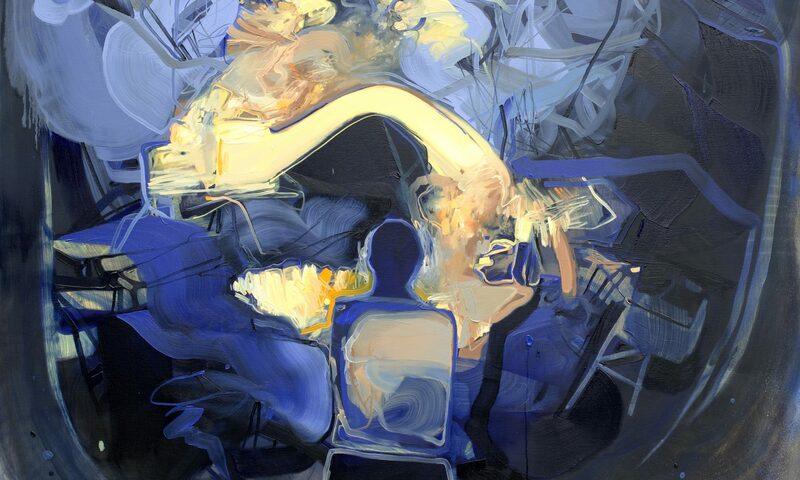 This file is called “limbo” because these poems are between realms. They aren’t dead but they aren’t necessarily living either. Over the years, this file has grown to immense proportions. There is one Word document that is about 150 pages of “limbo poems.” There are about 4-6 documents in this file on my laptop that are similar size. This means that of the 10 poems I originally wrote, only 5 were actually typed up for revision. Of these 5 poems, about half of them will be cast into limbo. Since half of 5 is 2.5, let’s say that I’ve been easier on myself than usual, and let’s round up to 3. I’m now down to 3 poems. If poem makes it through the digital revision process, I’ll then print it out and put it in a folder for pen-on-paper revision. Keep in mind that only 3 out of 10 poems make it to this stage in the process. As a result, only 33.3% of my poems are actually printed out for revision. This is probably the longest portion of my writing cycle.During the revision process I’ll work on a poem for a few weeks, few months or even a few years. Just because a poem makes to this point and receives quite a bit of attention doesn’t mean it’s safe. I’ve hammered away on poems for years only to determine that it’s not working and the poem will never reach it’s potential. Of course, it’s never the poem’s fault, it’s my own. On average, about 1 in 3 poems are discarded during this period. As I’m revising, I’ll ditch another 1 out of 3 poems, or 30% of these poems are whittled away into limbo. This means that 2 in 10 poems come out as “finished” products that the world may actually see or read. Of the 10 original poems, only 5 will be typed up leaving me with 50%. For every poem that actually makes it into a journal or a book, there are 4 other poems that didn’t make it through the process. This means that when I put out a book that is about 60 pages in length, I’ve actually written approximately 240 pages. And of these 60 pages of poems, I’ll still feel like 100% of them are not completed even after they’ve been published. These statistics aren’t exact. I’m a poet, give me a break. The point here is that this stuff doesn’t come easy for me, and for most other poets. If you’re one of those poets that everything you write is golden, good for you. This means that you’re probably extremely prolific and most of your writing isn’t very good. Don’t mean to be harsh, but it’s true. In summary, the odds are against me. Sure, I could be less stringent and less critical, but then I wouldn’t be continually setting higher standards for myself and my writing. Hopefully, my internal editor won’t get any harder to please because if that’s the case, the stats are gonna get worse, and I’ll eventually finish only about 1 poem a year. Right now, slow and steady wins the race. Except there is no race. I’m only competing against myself. This means that I’ll always win. And I’ll always lose.